Welcome back to Top Five Wednesday! I haven't done one of these in such a long time but this week's topic of 'books to read by the fire' was just too good to miss. As always, Top Five Wednesday is a weekly meme hosted by Lainey over at GingerReadsLainey and you can check out the complete list of Wednesday-ers here. 01. Burial Rites by Hannah Kent. I've just started reading this as it was my TBR jar pick for this month and I'm so glad I picked it up as it's the perfect winter read. Set in rural Iceland in the harsh winter of 1829, Burial Rites is the story of Agnes, who, having been charged with the brutal murder of her former master, is sent to an isolated farm to await execution. That synopsis sounds pretty depressing but although the story is quite dark in places, Kent's writing is beautifully lyrical and so atmospheric that it's the perfect book to curl up with by the fire. 02. The Night Circus by Erin Morgenstern. A magical realism novel set in Victorian times, The Night Circus centers around a mysterious travelling circus that only opens at night. But the novel is also about the secret competition between Marco and Celia, two strangers who have been trained since childhood by their mentors expressly for the purpose of this strange game. The competition isn't a battle, instead it is about intense magical one-upmanship, but unbeknownst to Marco and Celia, only one can be left standing at the end. The Night Circus is a very atmospheric, carefully constructed, character driven novel that weaves together so many perspectives and timelines. It really is so beautifully crafted and the magical atmopshere that's woven so intricately throughout the novel makes it a perfect Winter read. 03. The Wolves of Willoughby Chase by Joan Aiken. I read this book back in May for the 2015 Classics Challenge but I really wish that I'd saved it for this time of year as it's such a wintery read. The Wolves of Willoughby Chase is a children's classic set 'long ago, in a period of history which never happened' where England is overrun by wolves. Cousins Bonnie and Sylvia are sent away from their home by their evil new governess Miss Slighcarp and the story unfolds from there. It's a fast-paced and heartwarming adventure story, with lovable well-developed characters. Again, the story is extremely atmospheric, Aiken's descriptions draw you right into the world and the writing is compelling and beautiful. This is a really quick read and perfect if you're looking for a heartwarming winter tale. 04. The Land of Stories series by Chris Colfer. I've gone on about this series of unique fairytale retellings a lot but let me repeat that you really need to read this series if you haven't already! The Land of Stories is about twins Conner and Alex who accidentally find themselves in the fairytale world and run into all sorts of trouble and adventures as a result. I absolutely love this series, as it's middle-grade/early young adult the books are really easy reads and they're just so lovely and heartwarming. 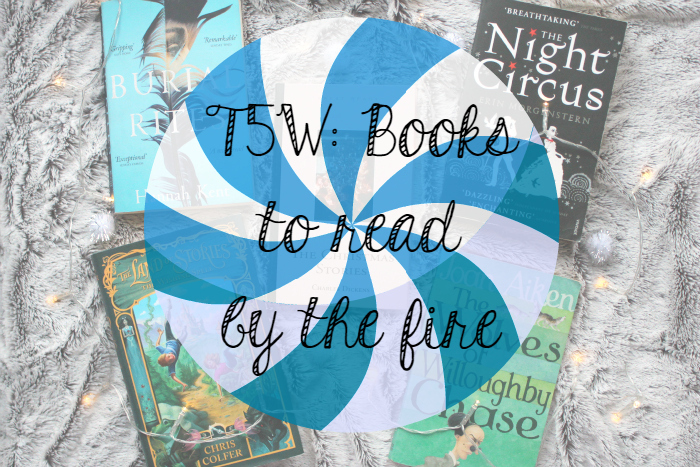 You really can't go wrong with fairytale retellings in winter and this is the perfect series to go for. 05. The Christmas Stories by Charles Dickens. This is such an obvious one but I've actually never read Dickens' A Christmas Carol, so I'm planning to curl up by the fire with this book which contains the classic Christmas tale alongside some other of Dickens' festive writings. I'm reading this for the 2015 Classics challenge so look out for my review coming soon! Have you read any of these books? What's your favourite winter read?